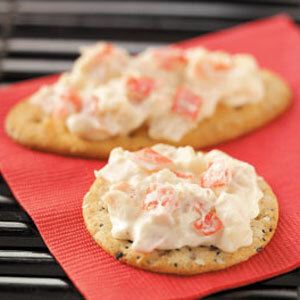 Spicy Crab Dip | What's Cooking at the Genua's? Long time no post! I’m still trying to get in the routine of blogging when I get home from work. Being I don’t get home till 7pm it’s been tough. But I am determined to get back into this everyday, again. Today’s recipe I found through Taste of Home magazine. I had gotten it in an email. I used to get the magazine but have had to cut back so now I just get emails. This recipe is simple, quick, low-calorie and delicious! Plus it won’t break the bank. It uses the imitation crabmeat but feel free to use the real stuff if you want! I also substituted light mayonnaise and light cream cheese for the full fat ones. Again, feel free to use the regular kind. It can be served with crackers or veggies. Your choice! Enjoy! 1. In a food processor, combine the first eight ingredients. Cover and process until smooth. Transfer to a large microwave-safe bowl. Stir in the crabmeat, mix well. 2. Cover and microwave on HIGH for 2-3 minutes or until bubbly. Serve warm with crackers or vegetables.